This already indicates the two sets of arguments you will need to have at your disposal to answer questions on this topic. In answering questions about October, you will largely be referring to events from the year 1917. The course of events in 1917 from the fall of the Tsar to the October Revolution can get complicated very quickly if you start looking at it in detail. I present here a brief and simplistic overview of key developments that you are likely to need to refer to in answering exam questions. One particular area I have neglected is changes at the top of the Provisional Government, and you might wish to find out yourself about the reshuffles of 5 May (when socialists entered the coalition) and July (when Alexander Kerensky became Prime Minister). An initial point to clear up is that of dating. The Julian calendar was still used in Russia at this time, and was 13 days behind the Gregorian calendar used by most of the rest of the world then and now (the Bolsheviks introduced the Gregorian calendar at the start of 1918). This means that the Bolshevik insurrection in Petrograd took place on 25 October in the old dating system, but 7 November in the new one. The simple message is: don’t get confused. The examiners seem to use the form “October/November” or refer to the “November revolution”. I’ve used the old style dates here. March 1917 – formation of Provisional Government under liberal leadership. Initial “honeymoon period” sees near-universal acceptance of the new order and a wave of liberal reforms that dismantle the repressive apparatus of the Tsarist regime. Crucially, the new government continues to prosecute the war alongside its western allies. 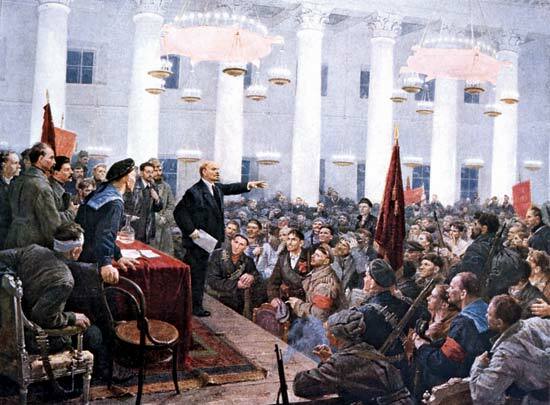 April 1917 – Lenin returns to Petrograd from exile in Switzerland and sets out the goal of a second, socialist revolution under the slogan “All Power to the Soviets” (his “April Theses”). 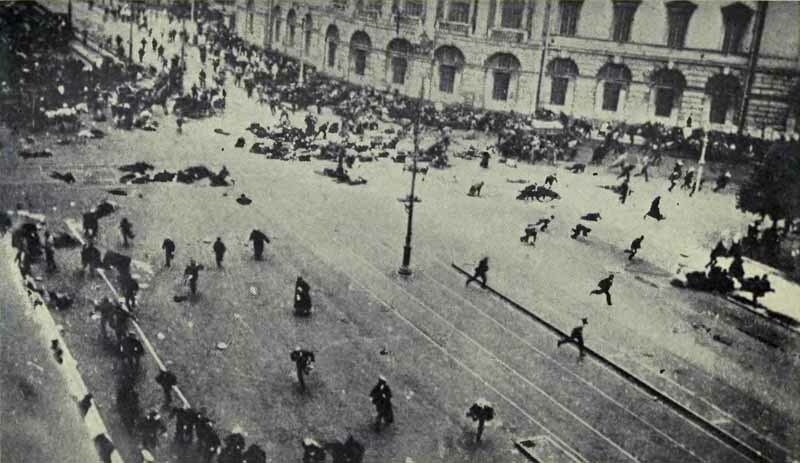 July 1917 – the “July Days” – spontaneous rising in Petrograd, suppressed by force after Lenin chooses not to support the insurrection. Kerensky becomes Prime Minister and Lenin is driven underground. At this point the Provisional Government appears to be firmly in control. 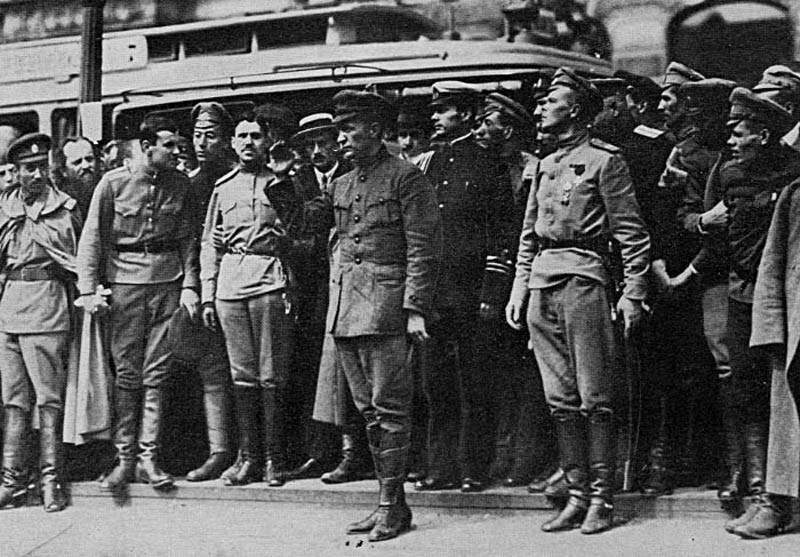 August 1917 – the “Kornilov Affair”. Kerensky appoints General Kornilov as Supreme Commander and summons him to Petrograd to provide military backing for the Provisional Government. Kornilov, a hard right-wing conservative, intends instead to seize power and establish a military dictatorship. Kerensky is forced to call on, and arm, the Soviet to defend the revolution – the Bolsheviks play a key role in organising the defence of the city. Key outcomes: Kerensky is discredited, the Provisional Government critically weakened, and the Bolsheviks are rehabilitated as the saviours of the revolution. September 1917 – thus the basic requirements for the Bolsheviks seizure of power were in place. The Provisional Government was now weak and discredited. In the aftermath of the Kornilov affair, the Bolsheviks became the most popular grouping in the Soviets across Russia, and the Soviet in Petrograd was now armed (these two points together meant that, when the Soviet formed a Military Revolutionary Committee on 9 October to control its armed forces, this MRC was under Bolshevik control). All this against a background of escalating social, economic and military collapse. At this point Lenin decided that the time was ripe for the Bolsheviks to take power, and on 7 October he returned to Petrograd. Significantly, he first had to overcome substantial opposition to this goal from within his own party (Zinoviev and Kamenev, who wanted the Bolsheviks to work with other socialist parties to establish a coalition). On 23 October, Kerensky precipitated the final crisis by attempting to shut down two Bolshevik newspapers and curtail the MRC. 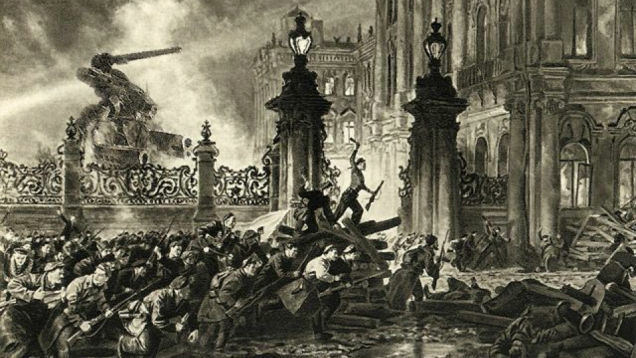 This served as a pretext for the events of 24-26 October, when Red Guards under Bolshevik command took control of key points around the city, entered the Winter Palace and arrested what remained of the government (Kerensky having fled). Notable they met little opposition in doing so. The denouement came on 26 October at the meeting of the All-Russian Congress of Soviets. The Bolsheviks presented the achievement of Soviet power as a fait accompli, which the Mensheviks and most SRs would not accept. 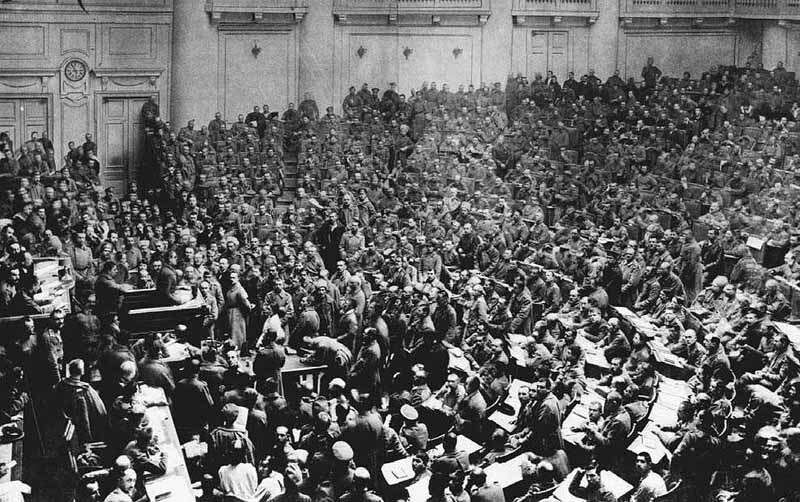 They stormed out of the hall, leaving the Bolsheviks in control of the Congress and enabling Lenin to announce the formation of a new government. 1. Why was the Provisional Government in such a weak position by October that it was overthrown with such ease? 2. Why was it the Bolsheviks who were able to capitalise on this power vacuum and replace the Provisional Government with a regime of their own? 3. How popular were the Bolsheviks and what role did popular support play in the events of October? the existence of the Soviets placed an impossible constraint on the power of the government (Order No.1 of the Petrograd Soviet, which stated that troops should only obey orders if they were also approved by the Soviet, is the most clear evidence of this) and in the long run it was impossible for this “dual power” scenario to last. A counter-argument to this would be that the Soviet leadership for much of 1917 had no desire or intention to topple the Provisional Government, being moderate socialists from the Mensheviks and SRs. the Provisional Government inherited profound and insoluble problems: economic breakdown, the collapse of government and social authority and the challenge of reconstructing authority on a new basis after the demise of autocracy, and above all the war. the war – the First World War was increasingly unpopular, the Russian army was increasingly incapable and unwilling to fight, and the war was responsible for major economic problems. You could argue that this was not an insoluble problem and that the government should have ended the war as quickly as possible – but this was easier said than done, and almost no-one in Russia in early 1917 envisaged actually pulling out of the war. the answer to this last question could be to point to the social structure of Russia and argue that the basis for liberal constitutionalism did not exist in Russia – the middle class was too small and too weak, and in short the workers and peasants of Russia did not WANT liberal democracy. You could support this point with the evidence of the Constituent Assembly election result from November 1917 (the only free and fair election that has ever been held in Russia, before or since), in which liberals won just 7.5% of the vote (of which the Kadets got 4.7%), with socialists of various stripes gaining 75.5%. political – the Provisional Government repeatedly postponed elections for the Constituent Assembly. But, as the results of these elections prove (above) when they eventually did take place, if the government had called these elections it seems likely that the cause of liberalism in Russia would have been extinguished anyway. the economy – the Provisional Government had no answer to basic problems of food shortages, unemployment and high prices that escalated throughout the year and radicalised the working class. Perhaps there was no solution in the context of ongoing war, but the perception was clear that the government was on the side of the bosses not the workers. the land – peasant land seizures escalated throughout 1917, and although most elements of the government were not wholly opposed to land redistribution they would not accept or legitimise the de facto redistribution that was taking place on the ground. This is not directly relevant to the events of October (which, like the February Revolution, did not involve the peasantry at all) but is part of the picture of a government losing support and losing control of the country. Lenin’s return in April gave the Bolsheviks a distinct programme encapsulated by the slogans “All Power to the Soviets” and “Peace! Bread! Land!”. Before April, the Bolsheviks were a bit-part player and the leaders on the spot in Petrograd were actually considering dissolving themselves back into the Menshevik party. After Lenin’s return, they were actively pursuing the goal of a second revolution. Lenin had to impose his April Theses against opposition within his own party, and again in October against the opposition led by Zinoviev and Kamenev. This supports the point that Lenin as an individual played the decisive role. the important role of Trotsky in actually planning and overseeing the details of the military insurrection, and in suggesting the clever timing to coincide with the Congress of Soviets that enabled the Bolshevik revolution as having established Soviet power. the discipline and organisation of the Bolsheviks, that enabled them to plan and act decisively to take power. This can of course be linked back to Lenin as the father of the party who had always insisted on discipline as a key principle of the party. This is debatable and historians now tend to argue that the Bolsheviks were a far less hierarchical and disciplined body than used to be thought; nevertheless I think you could still argue that, by October 1917, the Bolsheviks were the only organisation in Russia that actually possessed the organisational capacity to rule the country. The final point to consider is Bolshevik popularity and the role that popular support played in the overthrow of the Provisional Government. A seductively simple answer would be to assert that the Bolsheviks had overwhelming popular support, created by the simple set of policies “Peace! Bread! Land!” that appealed to all Russians. They were the only party seeking to immediately end the unpopular war (“Peace!”), the only party to accept peasant land seizures (“Land!”), and the only party that seemed to intend to address the needs of workers and that stood for workers’ power and radicalism (“Bread!”). In this simple form, however, this argument is unsustainable, and you should at all costs avoid giving the naive impression that you think the Bolsheviks came to power at the head of an unstoppably vast wave of popular support – the examiners have repeatedly criticised candidates who do this. The telling evidence is firstly that the actual events of the October Revolution did not involve the masses of workers (let alone peasants), and secondly that the election results from November 1917 show just 24% support for the Bolsheviks – significant, but not overwhelming popular support by any means. On the other hand, this point cannot be neglected entirely, and it is equally unsustainable (as anti-Soviet Cold Warriors used to hold) to argue that the Bolsheviks simply carried out a military coup d’etat against the wishes of the Russian people. It is clear (in the light of revisionist scholarship of recent decades) that in some sense the Bolsheviks did stand for – or perhaps more accurately were seen to stand for – the basic principles of a vast and amorphous popular revolution that was sweeping the towns and countryside, striving for popular self-government, whether in the form of elected committees within army regiments, workers’ soviets and factory committees in the cities, and the ancient peasant communes in the countryside. The question is: how did this actually help the Bolsheviks to take power in October 1917? I think the answer can be found in the link between the Bolshevik insurrection and the idea of Soviet power – the Bolshevik seizure of power was made possible by presenting it as the seizure of power for and in the name of the Soviets, and this was only possible because in September-October 1917 the Bolsheviks DID enjoy broad popular support in the Soviets (390 of 649 delegates at the Congress were Bolsheviks). As ever, I would encourage you to think carefully about these issues and come to your own conclusion about the relative importance of these different factors. If you want to argue that the October Revolution was indeed a military coup carried out by a tiny and unscrupulous gang of adventurists, then this will lead you to stress those factors relating to Bolshevik leadership, organisation and discipline. Similarly, if you want to construct arguments centred on “great men” as the decisive agents of historical events, then you will be focusing on those points about Lenin (and perhaps Kerensky) mentioned above. If you feel that liberal democracy was a possible outcome for Russia after the fall of the Tsar, then you will need to emphasise both the mistakes made by the leaders of the Provisional Government that squandered this historic opportunity, and again on Lenin and the Bolsheviks as the agents of its demise. If you are interested in the idea of the people’s revolution as a driving cause “from below”, then you will need to consider carefully what the connection was between this popular movement and the Bolshevik insurrection. 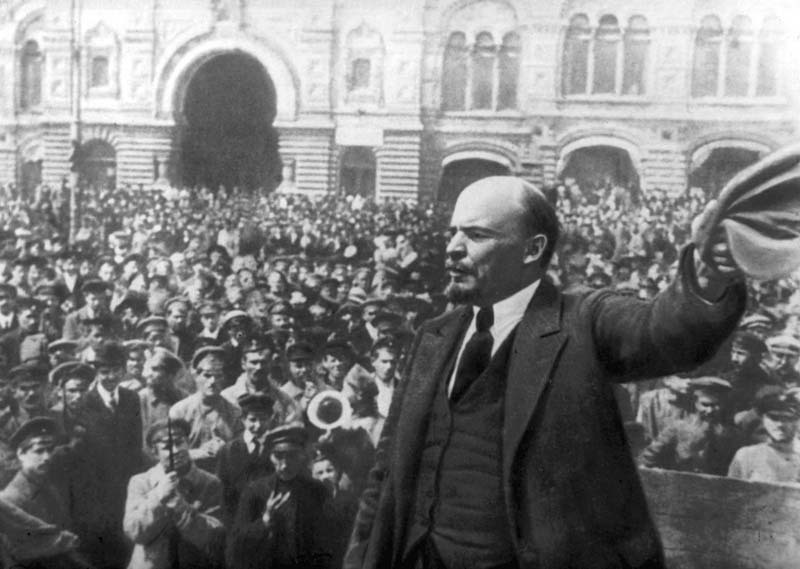 Did the Bolsheviks lead, hijack, or betray, the people’s revolution? These are the sort of considerations that will enable you to write impressive conclusions. This entry was posted in AS revision notes, Russia and tagged AS revision, history, Lenin, revolution, Russia, Trotsky, WWI by therationalcolonel. Bookmark the permalink.